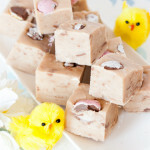 A creamy, dreamy Cadbury Creme Egg Fudge. So easy to make with only 4 other ingredients! Easter means Cadbury’s Creme Eggs – those chocolatey, fondant filled treats, Easter wouldn’t be the same without them. 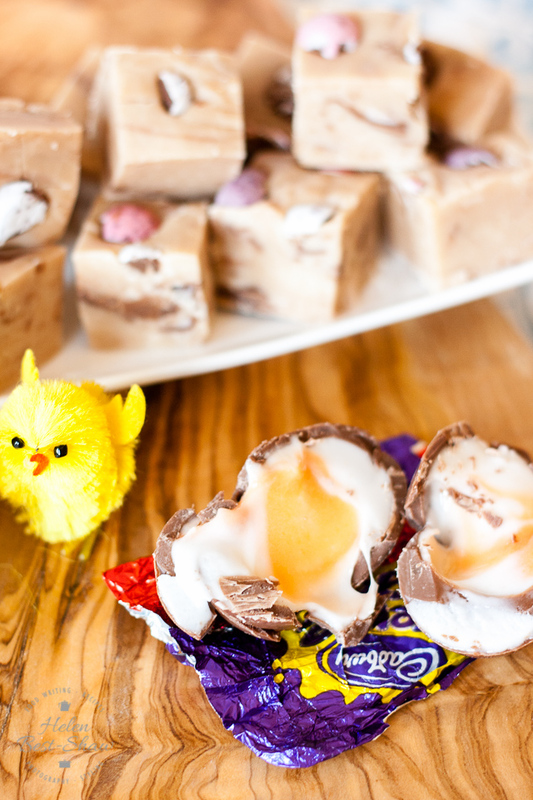 If you want some Creme Egg enjoyment, but don’t want to eat a whole one, our Creme Egg Fudge is perfect for you. Why not make a batch now! Our tradition is to have a Creme Egg before lunch on Easter Sunday – I recommend washing them down with a glass of champagne; the combination of sweetness and dry fizz works remarkably well. 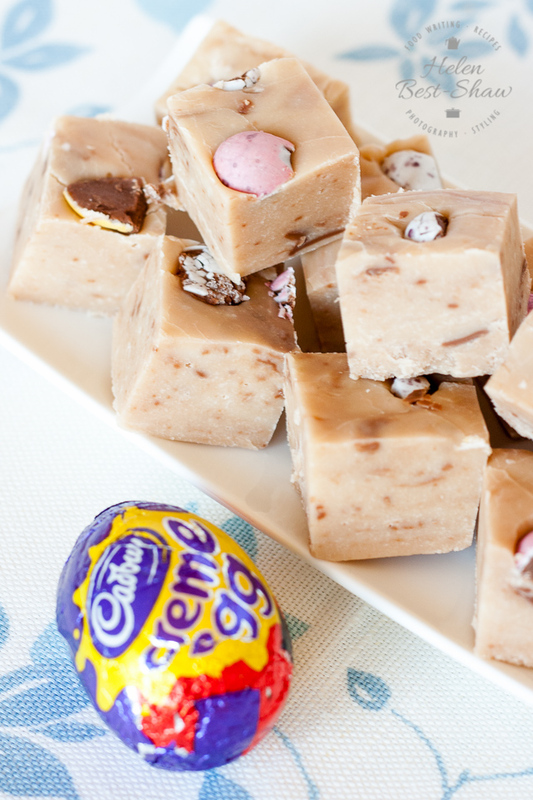 How do I make Cadbury’s Creme Egg Fudge? First: Melt and then simmer Creme Eggs in cream with sugar and butter added. Second: Bring the mixture up to 115°C – it’s easiest to check with an inexpensive digital kitchen thermometer. Third: Allow the mixture to cool. Beat the cooled mixture until it starts to thicken. Fourth: Stir in come smashed up Creme Eggs. Transfer the mixture to a lined cake tin. Scatter crushed mini eggs on top and allow everything to cool. Fifth: Once cool, turn out and cut into squares. Easy! How long it will last in the tin is another question! 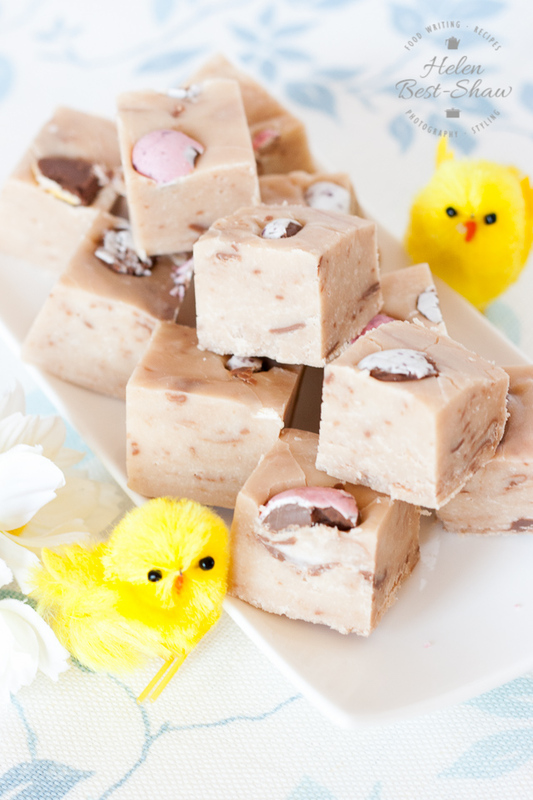 If you try this Cadbury Creme Egg Fudge please tag #FussFreeFlavours on Instagram or Twitter. It is amazing for me when for me when you make one of my recipes and I really do love to see them. You can also share it on my Facebook page. Please pin this recipe to Pinterest too! Thanks for reading Fuss Free Flavours! Line an 8” / 20cm square cake tin or gratin dish with foil (I like using parchment backed foil and lightly oil it). Place the milk, cream, sugar and butter into a large pan and bring to a gentle simmer. Allow to cook until the mixture reaches the soft ball stage, or 115C on a sugar thermometer (I have an electronic one with an alarm that beeps at the correct temperature). Beat with an electric mixer on a slow speed (or by hand if you are feeling strong) for about 5 minutes, until the mixture starts to thicken and looks matt rather than glossy. Stir in the smashed Creme Eggs with a wooden spoon – aim to distribute them throughout the fudge so you have a marbled effect, rather than letting them melt completely. Pour the mixture into the prepared tin and scatter the crushed mini eggs over and gently press them into the fudge (if using them) to decorate. Allow to cool, then pop into the fridge for a few hours to firm up before cutting into bite sized pieces.